We would like to welcome Keith Robertson Clinics to Moats Way Equestrian. Our first clinic will be held on Sunday 8th November. 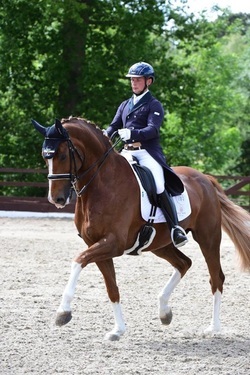 Keith Robertson is a Grand Prix Dressage rider and trainer and founder of Elite Performance Dressage, a dressage horse and rider training facility in Hertfordshire. For the last 10 years Keith has been a student of Emile Faurie, one of the most prolific producers of Grand Prix horses in the UK, who has represented Great Britain at European, World and Olympic Championship level. Keith is passionate about the training of horses from Novice to Grand Prix and is a keen producer of young horses. He prides himself on a calm, methodical approach, aimed at building not only the knowledge and understanding of horses in his care but also their confidence. This approach is also applied to the clients Keith teaches and has led to multiple Regional Championship and Area Festival winners and National Championship participants. A 45 minute lesson with Keith costs £65.00 which includes £10.00 arena hire. Payments are to be made prior to the clinic to secure places, via bank transfer. Please email jetrules@hotmail.co.uk if interested with your name, contact details, and a bit about your horse.